Most pet bird owners want to provide the best and most stimulating environment they can for their avian companions. 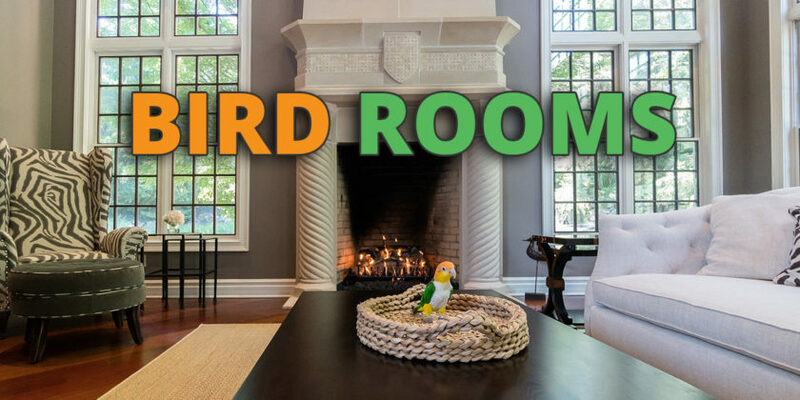 If you have the space in your house or apartment, one of the best ways to achieve this goal is to create a dedicated bird room. Spare bedrooms, porches, attics, basements, unused garages, and sunrooms all can serve as indoor bird rooms. Based on your climate and species of bird in question, you may be able to build an outdoor aviary as well. Bird enthusiasts who cannot devote a whole room to their pet birds can build or purchase an indoor aviary that affords your birds more space while still enabling you to use the room for other purposes. Why Build A Bird Room? Single Species or Mixed Flock? What Should I Put in My Bird Room? Your Birds Will Love It! Allowing your birds the opportunity to move around freely throughout the day in a safe environment. Creating an approximation of the bird’s natural habitat. Expanding the size and diversity of your flock. 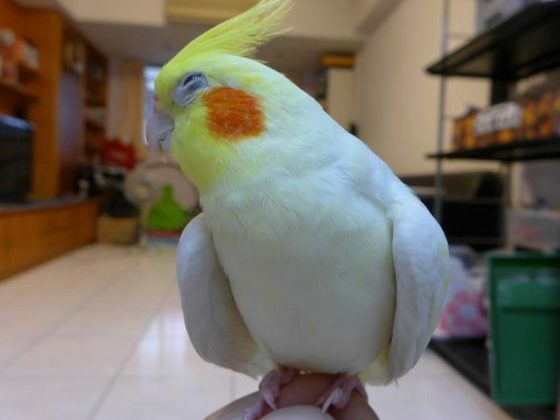 Separating your birds from other pets or family members who may be allergic to them. This problem won’t exist if you choose a hypoallergenic bird. Plugging all electrical outlets and safely covering or encasing wires. Removing ceiling fans or at a minimum removing the pull cords. Use bird safe lamp fixtures. Bird-proofing all windows and doors. Removing any potentially dangerous items (sharp edges, etc.). Ensuring that small birds cannot get trapped behind bookshelves or other large furniture items. Clearing the room of hazardous items such as candles and air-fresheners. Using a trash can with a lid so your birds cannot get caught inside. Making sure all cleaning products and paints are bird-safe. Removing carpet if possible as it traps dust and dander. Ceramic tile and linoleum are the best floor surfaces from a cleanup perspective. Using plastic panels for the walls near the cages to protect them from food and moisture. Employing air filters to minimize dust accumulation if necessary. This is particularly important if you have powder down birds because bird dander and dust issues could occur. See our full guide to bird dander here. Maintaining air-conditioning, temperature and humidity control to suit your species of bird. Installing full spectrum lighting to provide your bird with the benefits it needs from natural light. One of the most important decisions when setting up a bird room is deciding which birds will live in it. When mixing species it is important that they are fully compatible. 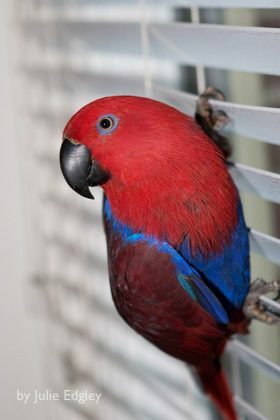 Parrotparrot.com cautions against keeping parrot-like species with non-parrots and also against keeping parrots together if their beaks are not very similarly sized. The number of birds can also be important, as bonded pairs will often turn on a third bird of the same species. Caution needs to be taken when mixing different species of birds. You also need to closely observe the birds when first moving to their new room as even birds that previously got along can have territorial issues in their new enclosure. In the video below, you can see an example of a large bird room dedicated to canaries. The answer to this question is highly dependent on the species of bird you are keeping, and whether you will have multiple species co-existing in the room. See the clip below for an example of one bird lover’s setup. Many bird rooms are used as day and night rooms, with the birds’ cages being a major part of the decor. Your birds can be let out to freely interact for all or part of the day, and then can be returned to their individual cages for sleeping. The cages should be kept open in the daytime as a bird may need some quiet time and prefer to get back in its private space. Some birds can be very territorial regarding their cages so keep an eye out for trouble and adjust your open cage door policy if need be. Your bird room can also be set up strictly as a playroom, used strictly during the day for out of the cage time. There need to be sufficient places for a bird to be alone for a time if it so desires, and one idea is to have a large, communal cage that all room inhabitants can share. Flockcall.com has some interesting ideas about taking the next step and going completely cage-free. Obviously, the type of birds you are keeping will have a major impact on the bird room’s furnishings. Assuming you have followed the size guidance above, all of your birds should be approximately the same size and therefore be able to enjoy similarly sized toys, perches, and other playthings. An important consideration is if your birds are fully flighted and don’t have clipped wings. If they are, then perches, swings, and hanging toys can be suspended securely from the ceiling. Birds that cannot fully fly need to be able to climb throughout the room, and may benefit from netting or rope ladders to navigate the room. Bird trees and playgrounds placed around offer your birds options for perching, resting and interacting with each other. If you plan to decorate with live plants be sure to carefully review your bird species and their ability to tolerate various plants. Using the wrong foliage can lead to tragic consequences for your flock. There is no denying that creating a bird room is a labor of love. The return on your investment of time, space, and money will be a feeling of satisfaction that you have allowed your birds greater freedom while maintaining their safety. They will thrive on the extra exercise and socialization that a bird room provides and if they could thank you, they would profusely! I love your set up, have some of these on order now and I’m going to give this a try. No problem, I’m glad you like the article Linda.